Performed qPCR on Friedman Lab machine targeting immune-related genes in hard clam. Rough plate layout/master mix calcs are here. 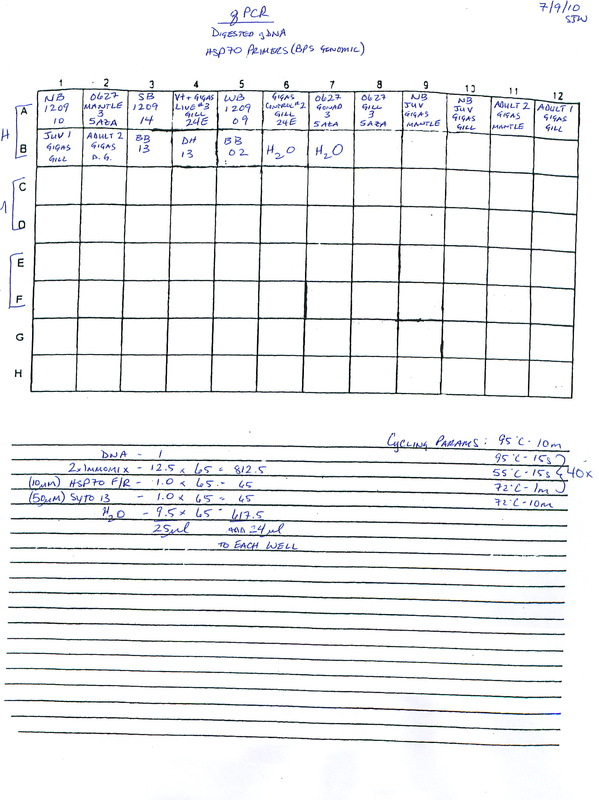 qPCR report from Friedman Lab machine is here (PDF) and shows cycling params, plate layout and Cts. CFX96 Data file is here. Raw fluorescence data was extracted (No baseline subtraction) and processed with PCR Miner. Data workup/analysis is here. Here is a graph of those primer sets producing an amplicon. 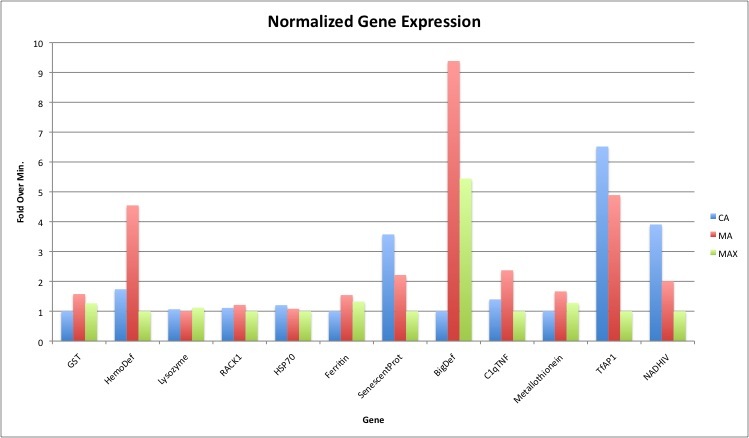 All were normalized to actin, which exhibited the smallest amount of deviation across all three samples of the normalizing/housekeeping genes analyzed. As a preliminary run with these genes, there are a number of promising candidates that could yield some interesting data regarding the physiological response of hard clam to exposure to QPX. This entry was posted in Miscellaneous and tagged BigDef, C1qTNG, CA, CFX96, CytP450-like, ferritnin, graphs, GST, Hard clam, HemoDef, HSP 70, Immomix, lysozyme, MA, MAX, Mercenaria mercenaria, Mercenaria_Rel, metallothionein, Mm_TRAF6, NADHIV, qPCR, RACK1, SenescentProt, STI, SYTO 13, TfAP1, TLR on 9 September, 2010 by kubu4.